This article was posted on 10th January 2017. 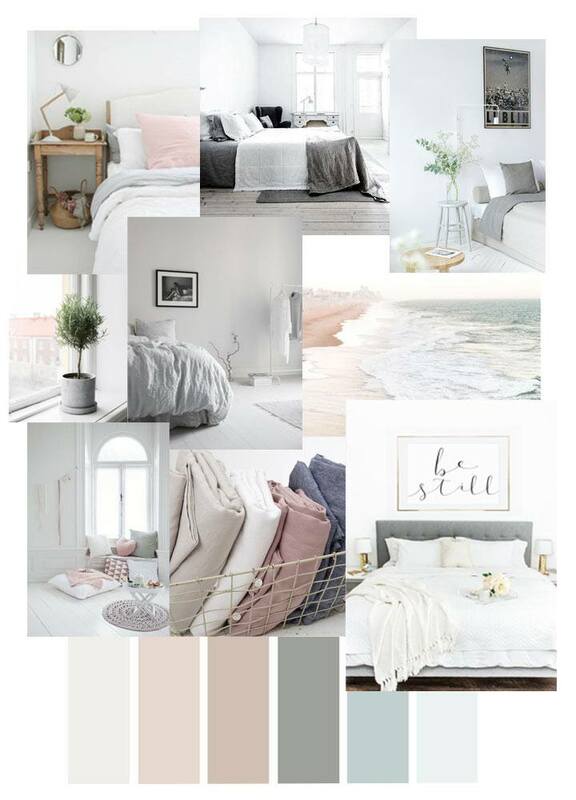 Don’t get us wrong, we love all the glamour, glitter and gold Christmas sprinkles on our homes throughout December, however, after all the festive splendour there is a welcome feeling of calm, when pale, serene spring neutrals begin to make an appearance. When the decorations come down, revealing the bare bones of our homes once more, it sparks a desire to freshen up our living space. We stop relying on the twinkling fairy lights for an ambient glow and invite the (slightly) longer days with muted, gentle hues to start the year with a cleansed interior. January is the perfect time to detox and simplify your home, after the mad dash of December, we all need a space to breathe, take stock and clear our heads for the year ahead. Classicism is being redefined to capture an earthy, simple and wholesome sort of minimalism in interior design which lends itself perfectly to a tranquil living space. There's a rising trend in embracing the elements, taking natural and rustic materials like wood and rattan, then partnering those warm components with a muted, white colour palette to create an air of serenity. Image credits: Apartment Apothecary, Melo Studio and Luminous Prints. White breathes a crisp freshness into a room, amplifying light, exhilarating where dark has reigned throughout winter, giving the sensation of space. White washed wood furniture and natural bare wood offset the purity and starkness of the colour palette, which magnifies light. 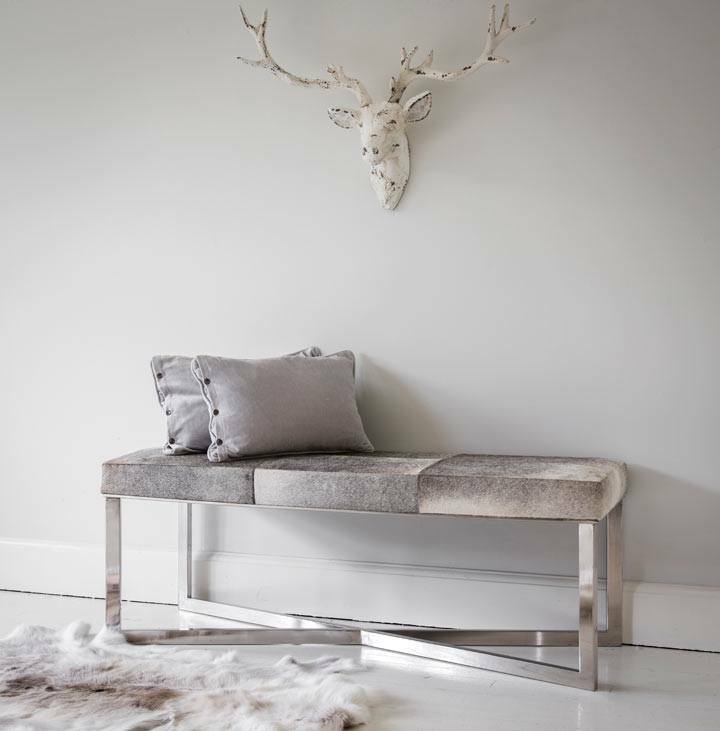 Homely touches of framed prints, accents of greenery and soft sheepskins balance the brilliance, so the overall effect is softened. One of the secrets to successfully achieving a relaxing space, is to ensure none of your elements - be it walls, flooring, furniture or accessories, are fighting for attention. Pastel hues perfectly complement white walls as well as the soft, natural wood tones of this delicate design. 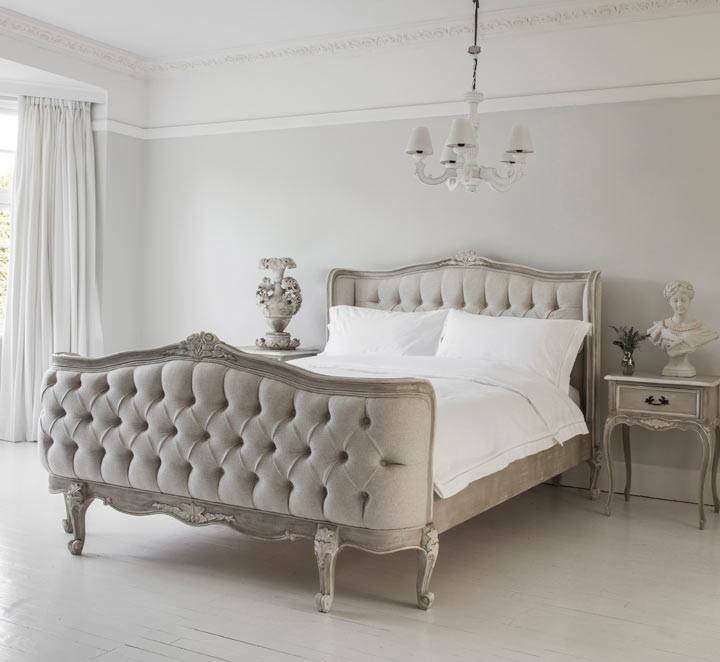 Pastels bring a soothing tactility to a room, which is vital to an otherwise clinical white surrounding. When scattered in snug textures: velvet cushions, silk bedspreads, sheep skin rugs and faux fur throws, the gentle colours, synonymous with blossoming milder months, can lend themselves perfectly to warming up a crisp winter's day. 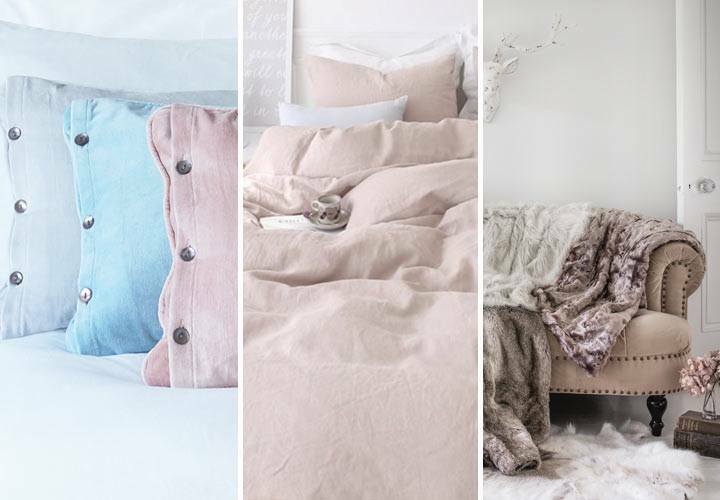 Velvet Cushions, Pink Linen Bedding, Pink Velvet Sofa and Faux Fur Throws. 1. 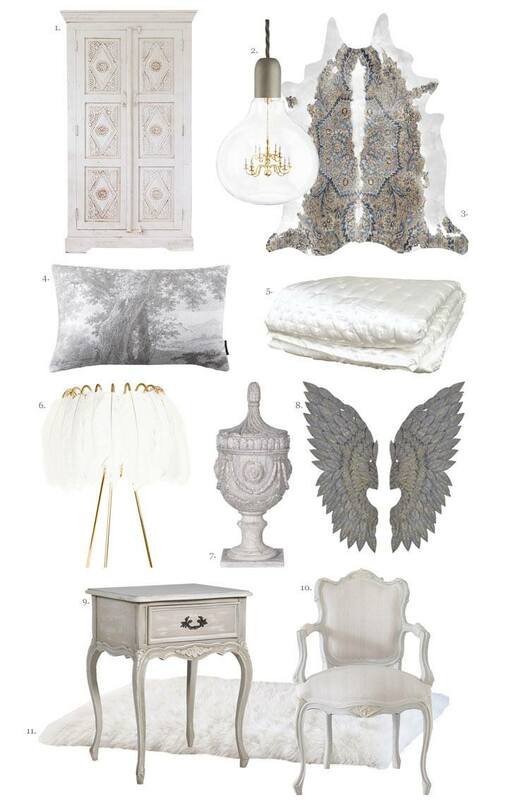 White Armoire 2. King Edison Chandelier 3. Printed Persian Cowhide 4. Grey Linen Cushion 5. Silk Bedspread 6. Feather Table Lamp 7. Grecian Urn 8. Metal Angel Wings 9. Painted Bedside Table 10. French Chair 11. Large Sheepskin.